giving others eyes to see." Christine Council is a prophetic worship artist, writer and speaker born and raised in North Carolina. She has a call to the nations as a mother, with a strong desire to see others know Jesus personally and intimately. Saved in 1988, from a sinful lifestyle, she immediately had an unction to start painting. Without any formal training, she was soon commissioned to create professional portraits, and later developed a local art school. 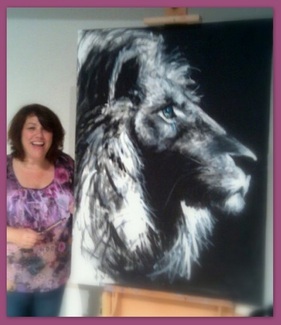 In 2011 she stepped out by faith and ministered with art for the first time; creating God inspired personal "prophetic portraits" at a Christian conference. A face to face encounter with Jesus dramatically changed her body of work. He commissioned her to paint corporate prophetic art, telling her to "start buying paint by the gallons," because she would pour much at His feet. Not long after, invitations came for her to speak to others about her work. In 2017 she received an invitation to preach her first sermon at a men's prison on Mother's Day. She has traveled throughout the USA and regularly ministers inner healing to believers all over the world over the phone or through the internet. When she's not on the road, sharing her heart, or her art, you can find her barefoot in her garden, at the lake walking her dog Cody, or out and about with her camera capturing God's creation. For the whole meaning of the strange thing called Art is merely this, that by copying a thing, by making it over again, and above all by making it over again with a slight difference, we can see something of the primary wonder of it, a spasm, as it were, of the enduring astonishment of God. Anyone, for instance, who has ever looked with certain feelings at a child's dolls'-house, knows the thing of which I speak. The very fact that the dolls'-house is small, makes us realise with surprise that houses can be so large. The very fact that it is not real makes us remember, with a sort of shock, that houses are real. We see the thing at second hand; and then only we realize it at first hand. In this the dolls'-house is the symbol and seed of the whole of art. Art, as I have said, has exactly the opposite aim to the aim of science. Science connects a thing with everything, that it may be natural and expected. Art isolates a thing from everything, that it may be unexpected, that it may be supernatural. ‎"Visuals are powerful. They say things that words cannot say. As the saying goes, a picture is worth a thousand words. Pictures reach places that words may fail to reach, penetrating the closed vault of our hearts and allowing us to see things that words only obscure."